Witney - Oxford route for tomorrow - suggestions ? The Sustrans routes appear to peter out here - any local knowledge to suggest a route to Oxford tomorrow and the train home ? South via Stanton Harcourt (can you cross the river @ Babcock Hythe to continue to Cumnor? Or north via Blenheim Palace and into the City on route 5? Re: Witney - Oxford route for tomorrow - suggestions ? Best I can suggest is to head to Eynsham on the back road, over the toll bridge (free for bikes - or used to be) and come in to Oxford on the Botley side. Bus/cycle lane from there to the railway station. Witney > South Leigh, pick up B4449 towards Eynsham, follow this to B4044, I'd then fork right towards Cumnor on the 4017 and the from Cumnor, down Cumnor Hill - wheeeee - into Oxford but you can just carry on on the 4044 under the A420 and come into Oxford close to Seacourt (Decathlon!). Two reasons for the detour via Cumnor, makes the trip a little bit longer and the freewheel down Cumnor Hill. I believe there _used_ to be a ferry at Babcock Hythe, but that it ceased operation decades ago. Haven't been that way myself so can't be certain about that. - the B4044 East of Farmoor is really pretty (and flat), and I've never experienced much traffic on it. It's certainly prettier than Cumnor Hill (a textbook example of strip development). Then came back on S1 via Eynsham thro Farmoor at dusk . We have plenty of time before train at 4 ! ... there is a bike path all the way along A40. Yeah, but it's a noisy, miserable ride and I wouldn't wish it on my worst enemy. Your, "follow our noses" plan sounds much better. -Oh these things appeal to cyclists who a fond of cheap motoring.... 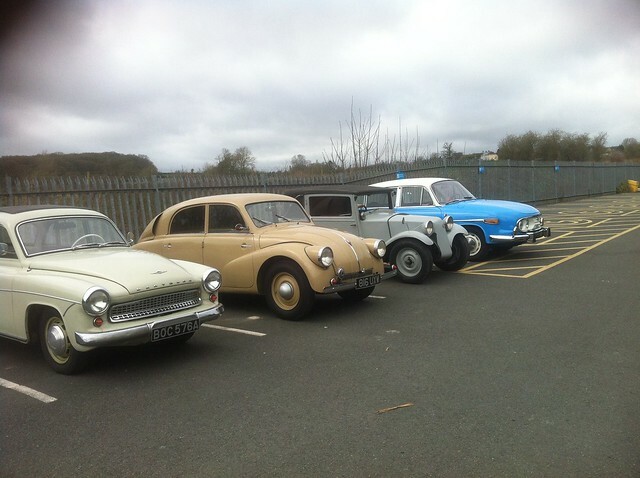 I think they were all right hand drive so assume the Tatra owners' club were having coffee there. The rest of the museum is excellent and after visiting a further refuelling, cycled east to hit the A44 and NCN route 5 which took us into Oxford in time for late lunch at the Botanic garden. They are having a twilight bus run next weekend which you'd not want to miss if you are nearby !